I have recently submitted a review with the title ‘E-assessment: past, present and future’. I think it is quite good, but I don’t yet know whether others agree with me! Imagine what I felt when I realised that Thomas Hench from Delaware County Community College was giving a paper at CAA2013 entitled ‘Electronic assessment: past, present and future’. Tom was similarly amused by our similar titles, but actually the papers are quite different. You’ll have to wait to see mine, but I’d like to say a bit more about Tom’s – it was one of the best papers of the conference. 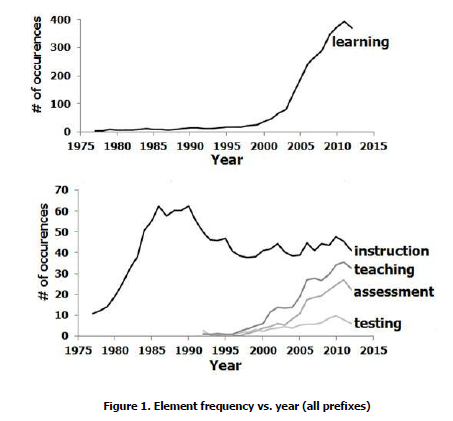 Tom had used ERIC to investigate ‘e-markers’ in around 5000 abstracts relating to e-learning and e-assessment, and the paper gave the frequency with which e-marker appeared in each year (using a rolling three-year approach). This enabled Tom to plot the ‘evolution’ of e-assessment, as you might do in considering the evolution of various genetic markers. 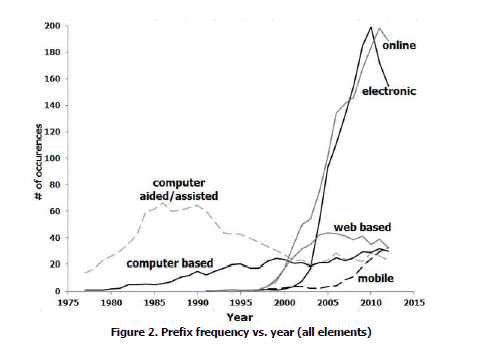 Now look closely at Figure 2 and note the recent growth of the prefix ‘mobile’. The question is, how much of an impact is this latest shift going to have? This entry was posted in e-assessment, mobile devices and tagged CAA 2013, e-assessment, mobile devices, Thomas Hench. Bookmark the permalink.